I’ve had that long panel in my head for months! Weird to see it IRL. Just cuz its a fun detail: if you look close you’ll see some of the rocks are colored blue/gray. That’s because most of the composition of this area (and a great deal of Mars) are volcanic basalts; the “red” of Mars is due to iron oxides. Where rocks are weathered or exposed, such as near the edge of the skylight, I guess you’d expect those to be more gray if they haven’t yet been covered by dust. Just to let you know, your link to the vote is glitched (an extra http:// got tagged on the end). Oh, thanks very much :) And fixed. That’s the easy part. Going back up will be tough work, unless there’s a motorized thingy that goes on the rope. Yeah, they use motorized ascenders, same as tree-climbers do. Doing it manually would be ridiculously taxing. Yeah, I had to do a lot of research to try and figure what sort of equipment they would have, that would be safe/ portable/ rugged but also not too much, since Devotion is such a small base. Maybe the rack descenders are too low-tech, but I thought it would be cooler/ more appropriate for them to be able to control their own rate of descent. I think she hit the nail on the head with the climbing tech they use. This doesn’t appear to be anywhere near the level of industrialization needed for things like full blown mine shaft elevators, and NASA would usually opt for the most weight efficient and cost efficient system since they are working on pretty tight budgets. A fixed elevator would either require you to ship a 120 meter elevator system to mars (too much weight) or mine the materials to build one their (too much $$$ for small mission like this). If they only need to transport people and people sized cargo up and down then why not use standard climbing gear like we use on earth? It would be designed for a stronger gravity well than mars, it has proven itself to be quite reliable, and it weighs fairly little in contrast to the rest of the stuff they brought. Plus, as was mentioned previously, there is always the risk of causing cave ins so you wouldn’t want to go mucking about with large humming and vibrating elevator machinery on the roof of a cave that you found because it already partially collapsed. There are no words for how much I love this comic. When you first began posting concept art of it I wasn’t sure if it would be my thing, but I’m on the edge of my seat waiting for new pages. 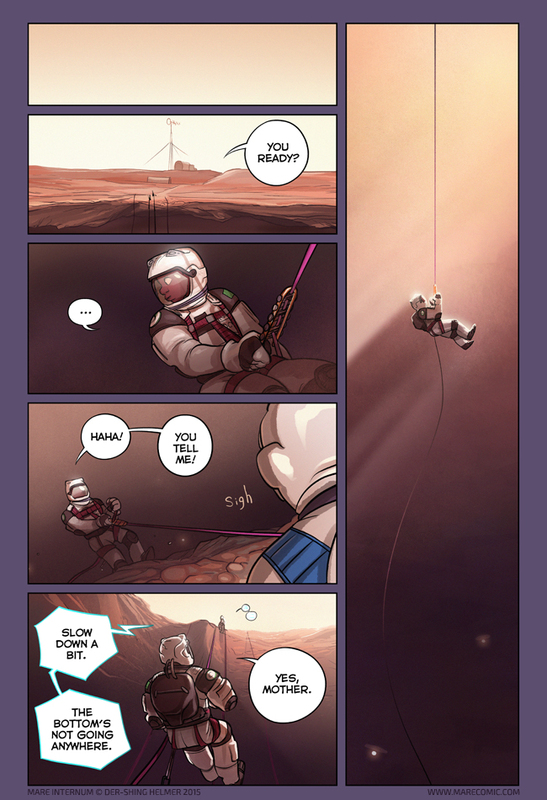 It’s not just the art and story, I love all the care that’s been put into researching how a place like this would function; I feel like I’ve learned a lot about Mars and space colonisation through the comic and your comments. If you plan to publish MI as a book when it’s over, I am looking very forward to owning a physical copy!! What made you decide to do a story about Mars? Well, Mars is super cool, haha. The original story had a very weird premise, which I can’t talk about without spoiling some upcoming stuff, but I’ll probably talk about it later XD But I’m really glad to hear you’re enjoying this so far! It’s a bit different than some other stuff out there, but I’m a huge fan of the exploration/ adventure genre, and wanted to add my own work to the mix. …it’s ok to be scared, Bex. I never thought of Mars being so beautiful. You can visit the NASA site(s) for the rovers and sift through the thousands of pics- each of which, even if the pic is only of a rock, is all perfectly untouched and perfectly natural. Lots of them can be combined (the Lefts & Rights of a particular scene) to make a 3D. Often these are not just beautiful but stunning! Also the detailed photos from the HiRISE orbiter show formations that will probably be obliterated in only a few hundred years by foot prints, tire tracks, settlements and trash dumps. As Buzz Aldrin said of the Moon: “A magnificent desolation”. Breathtaking! I wish I was there! The sunlight on the suit, as she is descending on the rope with the shadow cast behind the suit is a classic. Makes me think there is some dust in the air. The vertical panel on the right is awesome. I can’t imagine how helpless you would feel in that situation. I completely agree with Matthew Saint and Gostak Sakai. The panel is beautiful, super well done! “The bottom’s not going anywhere,” he said. I love it.